NARROWSBURG, NY (June 16, 2014) – The Board of Directors of The Delaware Company has announced the first recipients of two new recognition awards that will be presented annually by the group in the future. The awards were presented at the Fort Delaware Museum of Colonial History during The Delaware Company’s recent architectural/historical bus tour. The President’s Award, which is selected by The Delaware Company’s president, recognizes that individual who is deemed to have contributed over a long period of time to the support and promotion of the history and the historic landmarks of the region. The 2014 President’s Award has been presented to the architect Robert Dadras of Liberty, who first initiated the idea of an annual architectural/historical tour and has served as the organizer and narrator of each of the 19 annual trips conducted so far. 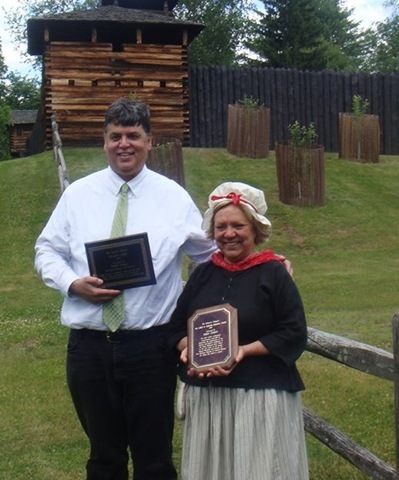 The James W. Burbank Memorial Award was presented to Debra Conway, the current Director of the Fort, for her vision, enthusiasm, perseverance and skill in advancing the appreciation of the history and historic landmarks of the Upper Delaware River valley in the true spirit of the former County Historian and founder of Fort Delaware Museum of Colonial History for whom the award is named. Burbank’s daughter, Peggy McIntyre, who as a teenager worked with her father at the Fort, was among those in attendance in the Fort’s pavilion, which had been dedicated last summer as the James W. Burbank Memorial Pavilion. Mrs. McIntyre’s two daughters and grandson were also present. The Delaware Company is a not-for-profit organization whose mission is to promote and support the history and historic landmarks of the Upper Delaware River Valley through education, outreach and fundraising. It is named for the group of Connecticut farmers who established the first permanent European settlement in the Upper Delaware River Valley in 1755.